Under the influence of modernism in Western art, Ikebana changed significantly in the 1930’s and Ikebana is still under that influence. What was the focus of the new Ikebana movement in the1930’s? The new Ikebana movement did not intend to deny everything about Ikebana which began in the 15th century with the establishment of Tatehana. Among the people involved in the new movement, it is not clear whether there was agreement about what and how much to change the traditional Ikebana. For instance, Sofu Teshiganaha (1900 - 1979), the founder of the Sogetsu school was looking into a rather small, but important aspect of Ikebana. He criticised the traditional Ikebana, particularly in between the Edo and Taisho periods which made too much of copying in creating and in teaching Ikebana. He commented that such an approach was not “artistic”. Here is an important point in finding out about his idea of “art”. I’ll discuss more about this later. Notably, in the period from Edo to Taisho there were two Ikebana booms in which the number of Ikebana schools increased significantly. I’ll summarise the characteristics of those booms in short soon. 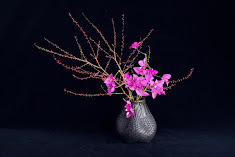 They would help not just to understand the overall history of Ikebana but also the crucial points of Sofu’s argument. After the second World War what occurred was the third and the largest Ikebana boom in which Sogetsu and Ohara, the major powers in the new Ikebana movement, as well as Ikenobo, played important roles. 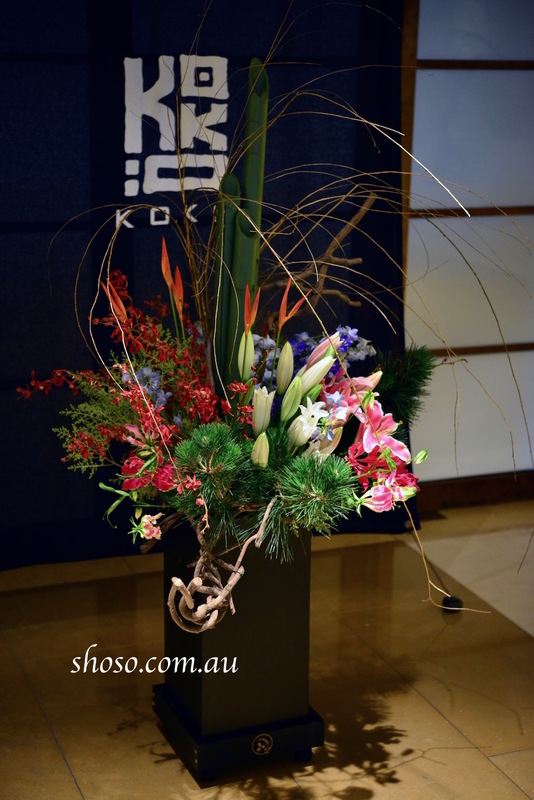 The image here is the work I made for Koko Japanese restaurant at the Crown Hotel during Christmas and New Year last year. I have been asked to create displays for them again this year. I hope you will have a chance to see my works there. I am going to participate in the Lorne Sculpture and the Biennale of Australian Art this year. I will be exhibiting the second and the third series of my environmental art following my award winning piece, Whale’s Stomach, at the Yering Station Sculpture Exhibition 2017. I hope you will enjoy them. My course at RMIT Short Courses, Japanese aesthetics: From flower arrangement to contemporary art will start again from 14 February 2018.